“WSU’s research, engagement and economic development efforts are strongly aligned with those of the CRTC, and we are excited about the potential of this partnership,” said Christopher Keane, WSU vice president of research. Anson Fatland, associate vice president of WSU’s Office of Economic Development, is newly appointed to the CRTC board. WSU’s Chris Keane speaks at today’s groundbreaking. CRTC will convert carbon fiber composite scrap material, left over from transportation and other advanced manufacturing industries, into new products. It will create hundreds of local living wage jobs, while diverting millions of pounds of composite materials from the region’s landfills. WSU and CRTC signed a memorandum of understanding to collaborate on educational opportunities, process science, materials development and testing and evaluation of products. The 25,000-square-foot building will house offices, laboratories, classrooms and manufacturing space for the recycling center and Peninsula College’s Advanced Manufacturing-Composite Technology training program. Keane joined Gov. 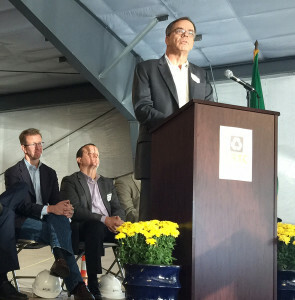 Jay Inslee, U.S. Rep. Derek Kilmer and representatives from Toray Composites America, Peninsula College and Janicki Industries to break ground for the building. WSU has a long history of working with industry to reduce waste through advanced knowledge and innovation in materials science. For instance, researcher Karl Englund recently partnered with Global Fiberglass Solutions to create composite materials from wind turbine blades. Englund also recently worked with Triumph Composites on a carbon fiber recycling project funded by the Joint Center for Aerospace Technology Innovation. Read more about the new center at http://www.portofpa.com/index.aspx?NID=152.